Honda Motorcycle & Scooter India launchedthe 2018 Gold Wing in India in December 2017. Deliveries for the 2018 variant commenced in June 2018. Despite the new chassis, suspension, electronics and a more powerful motor, Honda has managed to price the Gold Wing at the same price asits predecessor and is brought to India via the CBU route. For the first time in India, the Honda Gold Wing will be available in two variants - Gold Wing and the Gold Wing Tour. The Goldwing Tour has been priced at Rs 28.49 lakh and gets extra features like trunk, heated seats, electronic rear suspension preload and traction control. Whereas the Standard model is priced at Rs 26.85 lakh. It will be available only in Candy Ardent Red colour in India. The Honda Gold Wing can only bebooked at Honda Wing World dealerships. The Honda Gold Wing is a popular motorcycle among bikers who love to munch miles in comfort. 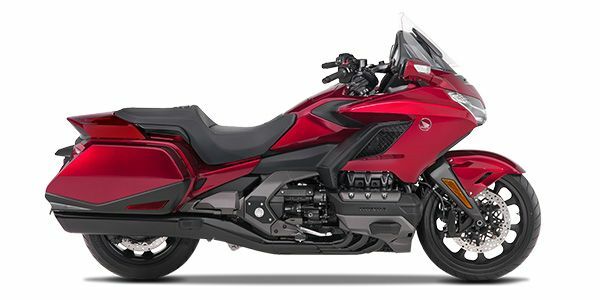 The highlights of the 2018 Honda Goldwing include the newly-developed, horizontally-opposed 6-cylinder engine, 7-speed DCT and Honda’s original double wishbone front suspension. The new Honda Gold Wing is lighter by a massive 40kg (379kg - kerb weight) in comparison to its predecessor. Honda says the new double wishbone front suspension has improved the centre of gravity of the bike thereby bettering its handling dynamics. The Honda Gold Wing competes against the BMW K1600 B, Indian Roadmaster and the Harley-Davidson Street Glide. Honda Gold Wing prices start at Rs. 27.79 lakh (Ex-Showroom). Honda Gold Wing is available in 2 variants and 2 colours. Share your experiences with Gold Wing? The Gold Wing is all about relaxed touring. All of which would be incomplete without the electronic wizardry it boasts of. The 2018 version gets ride-by-wire and four riding modes, namely: Tour, Sport, Econ and Rain, which a first in Gold Wing's history. There’s also keyless ignition, an electronically-controlled windscreen, music system, heated grips, and even an air-bag as an option. Let’s not forget hill start assist, ABS and the much-needed cruise control. The Tour variant of the Gold Wing additionally gets heated seats (not really a boon on Indian roads, unless you’re somewhere up North), a trunk that has keyless function, Honda’s version of traction control called the Honda Selectable Torque Control and electronic rear suspension, which allows you to adjust it with a button instead of having to remove the fairing of the bike, to do so manually. Q. 1. Servicing of gold wing in chennai or any other part of India.2. Fuel type for the bike and its mileage. 3. Practical handling on Indian roads with regards to bad roads, sandy stretches, engine heat Iissue, riding in traffic etc. 4. Cleaning and maintaining the bike. The 2018 Gold Wing gets all-LED treatment for the headlight and tail light units. The bike gets a huge 7-inch TFT full-colour display, which acts as a console alongside the two lit up analogue units and a small digital screen. Besides the fuel meter and speedometer, it also shows the outside air temperature, allows you to handle cruise control and also monitor the heater level. A USB flash drive plug-in and a Bluetooth headset are other ways to enjoy the ride while on the road and did we mention that it is the first motorcycle to get Apple Carplay? Both the standard and the Tour variants are available in India, but only in one shade - Candy Ardent Red. Honda also claims that the exhaust has been re-tuned to make a more ear-pleasing melody. The motorcycle is powered by a horizontally-opposed, liquid-cooled, 6-cylinder, 1833cc engine that gets aluminium cylinder sleeves with a shorter and stiffer crank. Overall, the engine is more compact and the starter and alternator are integrated into one unit. The motor produces 126PS of power at 5500rpm and 170Nm of torque at 4500rpm, which is 7PS and 3Nm more than what the earlier Gold Wing produced. The new Gold Wing also gets an all-new 7-speed Dual Clutch Transmission (DCT), which is unusual on motorcycles, as its something only seen in sports cars. All you need to do is shift gears by clicking the two buttons on the left switchgear. Besides this, the transmission setup doesn't just get a reverse gear but also a ‘Walking’ mode, enabling the ride to park the hefty tourer easily. Honda claims that the 2018 Gold Wing is the narrowest in its almost 4-decade long history. Suspension duties on the front is managed by a double wishbone unit, which is a pair of A-arms with a single shock and spring. Whereas the rear gets a monoshock damper. Braking is handled by 320mm disc brakes at the front and a 316mm disc at the rear. Both with combined ABS system. The front gets 18-inch wheel while the rear gets a smaller 16-inch wheel. The Honda Gold Wing’s Tour version weighs in at 379kg (kerb) while the standard one weighs 364kg. The seat height stands at 745mm and the ground clearance is 130mm, which is at par with any other big tourer out there. Harley-Davidson Street Glide: For 2018 the Street Glide gets updated suspension in the form of Showa Dual Bending Valve Forks. Its packed with features and shares its motor with the Softail range. The paint, fit-finish and build quality on the Street Glide are top notch and so is the infotainment system. The Street Glide is also priced in the same ballpark as its competition, at Rs 30 lakh. Indian Roadmaster: The Indian Roadmaster is built upon the iconic Roadmaster name used by Indian Motorcycles in the 1940s, and comes with a host of features. ABS, cruise control, remote locking hard saddlebags, heated rider and passenger seats, heated grips, keyless start and power windshield come as standard. The Roadmaster is a phenomenal motorcycle that's comfortable and well-built. It gets lots of storage space and has one of the most refined engines in the market. Yes, it costs a whopping Rs 40 lakh ex-showroom. But the Roadmaster is one of the best cruisers out there. in fact, this is how cruiser should be made. When compared to its competition, the Honda Gold Wing makes for a strong case, as it's not only more affordable but packs more features than what is being offered by other manufacturers. Whether it matches the finesse of the Indian Roadmaster is hard to comment on since we haven't ridden one. But going by what's on offer, it makes for a great deal. especially with the vast service network setup offered by Honda.